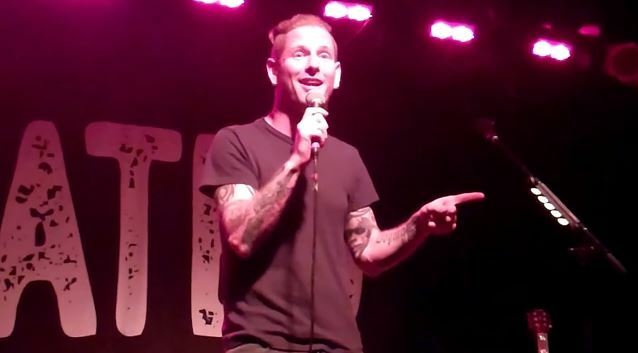 SLIPKNOT and STONE SOUR singer Corey Taylor released his third book, "You're Making Me Hate You: A Cantankerous Look At The Common Misconception That Humans Have Any Common Sense Left", on July 7 via Da Capo Press, a member of the Perseus Books Group. The book acts as a commentary on society and pop culture and has been described as "Taylor's take on Peter Griffin's 'You Know What Really Grinds My Gears'." Taylor promoted the book with a combination of bookstore events and a solo tour which were one-of-a-kind shows featuring readings from the book, acoustic performance, and audience discussion. Fan-filmed video footage of Taylor's entire July 11 appearance at the Bottom Lounge in Chicago, Illinois can be seen below. Taylor said that his original title — which the publisher refused to allow him to use — was "You're Making Me Hate You (Or How Justin Bieber Sucked A Million Dicks To Make His Money)". Taylor's last book, "A Funny Thing Happened On The Way To Heaven", was published in the summer of 2013 and landed at No. 23 on the New York Times "Hardcover Non-Fiction" best sellers list. His first book, 2011's "Seven Deadly Sins: Settling The Argument Between Born Bad And Damaged Good", also made the list at No. 26.